Amazon.ca has discounted the original Sonos Play:1 wireless speaker by 20%, taking the price down to $199, in either black or white. This is the lowest price ever on Amazon.ca and matches a sale last year during Black Friday. If you don’t care for built-in smart speaker controls like the newer Sonos One, the Play:1 is still a solid speaker, as it shares the same hardware as the latter. If you have an existing Alexa device, it will be able to control the Play:1. Two Play:1 speakers can easily be paired together to make a stereo pair, which will provide some pretty decent sound for the price. 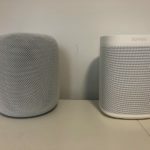 In our recent Apple HomePod review, the Sonos One was able to nearly hold its own versus the iPhone maker’s newest speaker. Also, Amazon has the Play:3 in white on sale as well for 13% off at $329.99. Click here to jump on the Play:1 while it’s still on sale on Amazon.ca and BestBuy.ca.